Bill Cosby, Jesse Jackson, and one former and one current D.C. mayor came together to pay tribute to the power of a chili dog. Ben’s Chili Bowl, the District’s iconic hot dog joint, celebrated its 55th anniversary Thursday morning with a crowd of well wishers, employees, celebrities, and local politicians. The celebrants gathered in front of the restaurant at 10 a.m., fanning themselves in the August heat. News and radio vans clogged U Street, from TBS to WPGC, "D.C.’s home of at least 18 jams in a row." Founded in 1958 by Ben Ali, an immigrant from Trinidad, Ben’s Chili Bowl played an important role in the city’s civil rights history. Organizers of the historic March on Washington, which is celebrating its 50th anniversary this weekend, met in a backroom of Ben’s in 1963 to hammer out plans for their takeover of the National Mall. Virginia Ali, Ben’s widow, recalled feeding buses of people who came into town for the march. "I remember people coming into the Chili Bowl, having something to eat before going to the march," she said. "I remember the enthusiasm of many people about going down there to march for equal rights and jobs." And when the 1968 riots engulfed the District of Columbia following the assassination of Martin Luther King, Jr., Ben’s was one of the only businesses in the area to stay open. "Isn’t it a great day in the District of Columbia?" Mayor Vincent Gray asked the crowd. For Gray, whose 2010 campaign has been the subject of a federal investigation over alleged straw donors and corruption, any day spent talking about chili dogs is a good day. Gray announced Thursday as "Ben’s Chili Bowl Day" in the District of Columbia and spoke of how he often visits Ben. He wasn’t just pandering. About a month ago, I spotted Hizzoner picking up a half-smoke around 1 a.m. on a weeknight, still dressed in a sharp suit. One is likely to run into just about anyone in D.C., from the mayor to Supreme Court Justice Sonia Sotomayor, during the pre-dawn, post-bar hours at Ben’s enjoying hot dogs smothered in chili and cheese. Rep. Eleanor Holmes Norton, D.C.’s non-voting delegate in Congress, also promised action on the chili front. "You’ve gotten everything else that the city can give, so when Congress returns from recess—they’re out there until Sept. 9, so they can do no harm at the moment," she said to laughs. "I’m going to take it to the floor of the House and give Congress an opportunity to commemorate a historic institution that it needs to take note of—one that could soften the heart, certainly the taste, even of the Tea Party House of Representatives." As Norton was talking, a murmur spread through the crowd. Former D.C. mayor and current City Councilman Marion Barry, Jr. had arrived and was working his way through the crowd. Jackson spoke for about 30 seconds, leading the crowd through a call-and-response recitation of the poem "I Am—Somebody," a staple of Jackson speeches. Later, Jackson squeezed through the crowd to leave, followed by a burly body man wearing a "Rainbow Coalition" lapel pin. "His son’s in jail now," a man next to me said to his friend. "Ain’t that a mess," the friend replied. Nevertheless, Jackson was besieged by well-wishers and huggers. But the real draw was Bill Cosby. The famous comedian has been a stalwart supporter of Ben’s for decades. According to the signage inside the restaurant, he’s the only person besides the Obama family who eats for free at Ben’s. Cosby was the M.C., introducing long-time employees and family members, and gently ribbing them. At the back of the crowd, a scraggly, wild-eyed man kept shouting, "They call me Mr. Tibbs!" at Cosby, apparently mistaking him for Sidney Poitier. "I told you to take your medication," Cosby said. As Cosby introduced the family members, the event took a bittersweet turn. Ben Ali died in 2009, but his sons and daughter carry on the spirit of the restaurant. 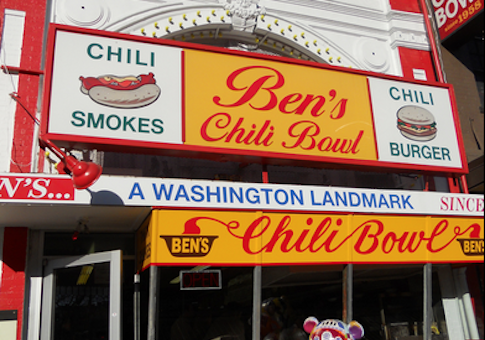 In fact, they are opening a Ben’s Chili Bowl franchise in the H Street corridor sometime next year. The overriding theme of the tributes to Ben’s was not the chili dogs themselves, which are—sorry I’m not sorry, Chili Bowl defenders—fairly unremarkable, but the work ethic and philosophy behind them. The discipline of hot dogs. "A woman doesn’t lift weights, but she can look at you and turn you into a human being with some sense," Cosby said of Virginia Ali. "Ben’s Chili Bowl—not only a place to come and visit, meet your friends, but a place of humanity. That’s what that philosophy has always been about." Ben’s Chili Bowl has achieved the storied status where it starts to reflect the qualities you value most in yourself. At Ben’s Next Door—a bar and sit-down restaurant aptly titled, being next door to Ben’s—a birthday cake sat on the bar. People filtered in off the sidewalk for 55-cent hot dogs and cold beer. Marion Barry walked into the restaurant with assistance of a striking young woman in a blue dress. For Barry, who rode out a humiliating jail sentence in the ‘90s, only to be reelected mayor, the lesson was clear. "Ben’s is more than just a restaurant or a place to get food. It’s an institution," Barry told me. "It represents strength and determination. It would have been very easy to give up during the riots. Close up, go home. It shows resilience, courage, it shows tenacity. That’s more important than the food it serves." This entry was posted in Politics and tagged Feature, Marion Barry, Vincent Gray. Bookmark the permalink.